PIZZA REPORT: Santarpio's combines barbeque with pizza in an absolutely brilliant fashion. Never before have I had the pleasure of eating homemade sausage on pizza. It is delicious. The tomatoes were also very tasty and cooked on a bed of greasy shredded mozzarella cheese. This is all supported by a corn meal crust which is both firm and crunchy. It's sits a bit heavy but it's very filling. ATMOSPHERE: What a deal! Santarpio's offers great service, a large seating area, and extremely low prices (tons of pizza for about $9-10 each). 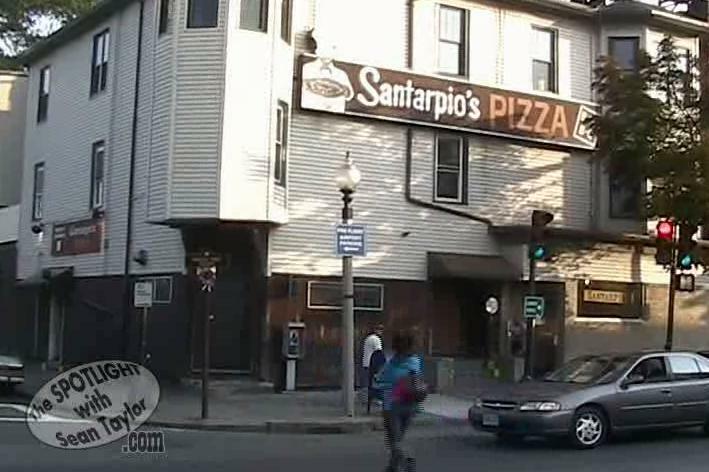 It's located near Logan airport in East Boston which is probably convenient, however, the streets of Boston confused my GPS and somehow we ended up at the airport twice before we got to Santarpio's. Avoid the rush and beat the lines and, hey, while you are waiting for your pizza, try the delicious kabachi bbq and peppers as an appetizer. Nat Rink celebrated his birthday party in Boston, which is why we came to Boston. It's also why he came to Boston. See, he doesn't live in Boston anymore but still prefers to celebrate his birthday there.